Our Little Children - Specially Blessed by God! MOST of us cannot help but marvel over the lovely innocence of beautiful children cooing away in their cribs, crawling on the floor or scampering about the play area outdoors. Neither can we help but believe there are angels who constantly protect these little ones from injury or death as they blunder thoughtlessly into danger after danger! Our children do not possess charmed lives. They can get into mischief quickly — stumble into danger at the wink of an eye. But angels do exist. God's angels can and do intercede for children faster than that "wink of an eye." The Bible tells of angels intervening in the lives of God's servants in both the Old and New Testaments. Time and space cannot hinder their speedy intercession to save God's people — and their children — from dire calamities. To God we are all His own little children, if we are begotten by His Spirit (I John 2:1, 12, 18). He watches over and protects us with a special loving concern. And we can be thankful that he does! We really are, of ourselves, helpless amidst the growing problems of this age. Not just ordinary dangers surround us and our children, but God's Church also faces assaults from the media and hostile groups outside the organization. We are indeed like little children, as defense less as they are in this world of Satan's. We need help from above — the "strong hand from someplace"! Increasing pressures on parents striving to rear their children properly and safely wear us all down. Some give up and let their progeny go their own way. Only when we are truly born of God as members of His Family in the Kingdom of God will we have universal safety from the wiles of Satan. Without the devil around (Rev. 20:2-3), great strides can be made. Only when Christ's rulership over all the earth comes can we expect complete relief from the dangers that surround us and our children. But what about now? How can we raise our children safely and teach them the proper way of life in today's world? Well, would God call us to understand His truth and actively participate in His great Work if He were not willing to provide protection for us and our children? No, our children can, in the future, be strong laborers for God. The Kingdom of God is now just ahead of us. The prime talent for the Work of the Kingdom resides in the homes of the saints today — in our children. God knows this. He planned it that way. And our Creator expresses His great love for our children through the many blessings He makes available for them. Jesus Christ showed great concern for little children. However, initially the disciples failed to understand this concern. "Then were there brought unto him little children, that he should put his hands on them, and pray: and the disciples rebuked them. But Jesus said, Suffer little children, and forbid them not, to come unto me: for of such is the kingdom of heaven. And he laid his hands on them, and departed thence" (Matt. 19:13-15). "And they brought unto him also infants, that he would touch them: but when his disciples saw it, they rebuked them. But Jesus called them unto him, and said, Suffer little children to come unto me, and forbid them not: for of such is the kingdom of God. Verily I say unto you, Whosoever shall not receive the kingdom of God as a little child shall in no wise enter therein" (Luke 18:15-17). 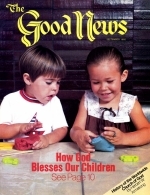 Luke and Mark broadened the concept of the blessing of the little children. Luke used the term infants to describe these children, and Mark recorded that Christ was able to take them up in His arms (Mark 10:13-16). That Christ could take them up in His arms shows they were not more than six or seven years of age. It is obvious Christ was blessing small children, too young to provide solutions to their own problems. Notice that God has commissioned angels to the task at hand. "Take heed that ye despise not one of these little ones; for I say unto you, That in heaven their angels do always behold the face of my Father which is in heaven" (Matt. 18:10). Herbert W. Armstrong recognized God's concern for children and the importance of the ceremony Christ performed. Thus, from the beginning of the Church in this era, Mr. Armstrong has observed this moving ceremony for our children. For years the Church conducted the blessing of the little children — those not blessed in previous years — in the last afternoon service of the Feast of Tabernacles. Over the years, as the numbers attending the Feast grew and the number of infants to be blessed increased, the demands in time to perform the service also grew. Mr. Armstrong instructed that the blessing of the little children should no longer be done at the Feast sites. He noted that God had raised up numerous churches pas to red by dedicated, qualified ministers of Jesus Christ. The service became the responsibility of the pastors in these churches. The second Sabbath after the Feast of Tabernacles was set for the parents to come prepared for the service in each church. So just before the sermon on the second Sabbath following the close of the Feast, the scriptures quoted above are read and a general prayer is given. The ministers, in pairs, take each little child up, lay their hands on him or her and pray for God's protection and blessing beyond that which the parents are able to provide. As members watch and each child is taken up in the ministers' arms, a sentiment of appreciation for God's love and concern spreads throughout the congregation. Prayers pour up silently before His throne, adding an "amen" to those of the ministers who pray over the children. Throughout the 15 minutes or so of this special ceremony, all appreciate that each child being so blessed is specifically sanctified before God in heaven. Many adult tears come at the innocence and trust in the eyes of the little ones as they look up into the faces of the ministers holding them. There is no comparable service in the Church of the living God! Look forward to this ceremony in your church. This special blessing is for your children, so they can have God's guaranteed extra protection and blessing for the troubled days through which they have yet to live. Then when Christ returns — very shortly now — to receive them to Himself, they will have been prepared to become co-laborers with Him in His limitless universe for all eternity!